Put on an apron, pop the champagne and prepare to fall in love just like Ina and Jeffrey Garten. It's no secret that Ina Garten loves to listen to a little music while she cooks. Taylor Swift may be one of her all-time favorites, but come February, the Barefoot Contessa is now spreading the love. Ina Garten's new Valentine's Day playlist might just be the best thing to seal the deal since her Engagement Chicken recipe. The compilation of heartwarming classics with iconic artists like Al Green, Etta James, Frank Sinatra, Nat King Cole, Marvin Gaye, Nina Simone and more, embodies everything there is to love about Valentine's Day — and Garten herself! The most amazing part? She's not just playing it while cooking for her darling hubby Jeffrey but, this year, she's sharing it with the world. "Just in time for Valentine’s Day — a playlist of some of the best romantic love songs of all time," Garten posted on Instagram and on her website, Barefoot Contessa, Wednesday. "My “Ina’s Favorite Love Songs” [sic] playlist is available on Apple Music and Spotify — I hope you love it!" The post was accompanied by a cute photo of her husband holding a gorgeous bouquet of flowers. Apple Music requires Garten fans to download the songs individually or as a playlist (but without payment, a 20-30 second preview of each song is available). Music lovers also have the option to listen to Garten's selections for free on Spotify (the playlist will just be peppered with commercials). Spotify also offers $10 monthly memberships, which allows users to skip the commercials. Garten added: "Some great music, a glass of Champagne, and..... what’s on the menu is up to you!" We can certainly think of quite a few Barefoot bites we'd love to make. Whip up Garten's famous fig and ricotta cake, which she recently made with Katie Couric. Or take solace in Garten's classic comfort foods, like crispy mustard chicken and a salted caramel ice cream sundae. Turn up the playlist's sixth song, "La Vie en Rose," and pretend you're enjoying a night in Paris (one of Garten's favorite cities!) with Barefoot Contessa-superfan Jennifer Garner's favorite Garten recipe: beef bourguignon. And you could just skip the entrée all together and go for a simple cup of coffee, Jeffrey-style. 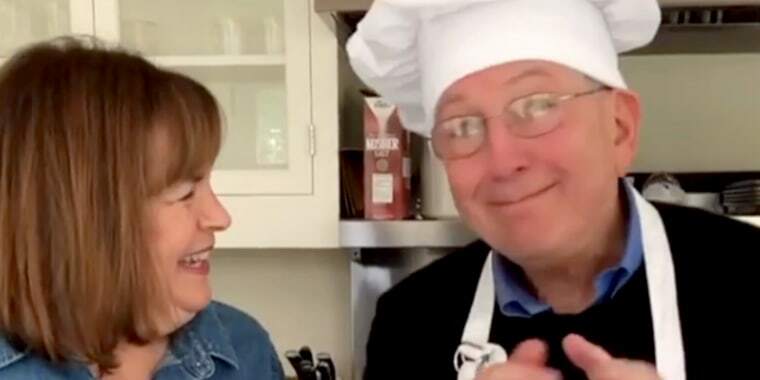 On the darling duo's 50th wedding anniversary, Garten attributed laughter and coffee to making their marriage a success since coffee is the one thing Garten likes her husband to "cook." But great tunes and good coffee certainly aren't the only things keeping the Gartens together. In 2018, Garten told TODAY Food some secrets to her (then) 49-year marriage — like how little gestures go a long way, why trusting your partner is key and how important it is to connect daily, especially when you're not physically together all the time. And she shared why cooking for the one you love is a symbolic gesture. "I think the best way you can express love by cooking for someone is figure out what they like — not what you like, what they like — and make it for them. And they'll feel really good," Garten told TODAY last year. So, now that Garten has made the romantic playlist, supplied the recipes and instructed all of us on how to have a joyful and long-lasting relationship, all we have to do is listen, eat and relax Feb. 14. Love, after all, is already in the air.